This just in: Heidi Waleson of The Wall Street Journal calls Amelia "highly original and gripping," in a review entitled "On So Many Levels, a Success." 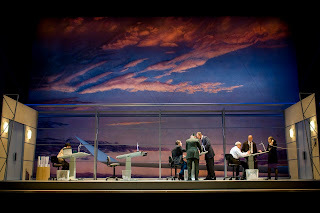 She praises almost every member of the creative team, design team, and cast, and says that Stephen Wadsworth's "subtle and incisive directing made the opera's multiple levels and interactions absolutely clear, communicating the story's emotional weight without allowing it to slip into sentimentality." Below are some of the other reviews and stories that have come in over the past few days. And if you have your own reviews to share, we'd love to hear them, either here or on Facebook! Marcie Sillman's story about Amelia ran last week on KUOW and yesterday on NPR's All Things Considered. Sillman spoke with librettist Gardner McFall and composer Daron Aric Hagen, and the piece also features the wonderful singing of Kate Lindsey, Bill Burden, Nathan Gunn, and other fabulous cast members. In the Financial Times, George Loomis discusses the final scene in the opera: "The expressive range of Hagen's music broadens memorably to accommodate the cascade of divergent emotions en route to a grand, life-affirming unaccompanied ensemble for the nine principal singers." Seattle Weekly's Gavin Borchert notes the "unerring clarity" of director Stephen Wadsworth's staging. He adds that Amelia "stakes out new territory for opera—not only in subject matter (the scarring legacy of the Vietnam War) but in stagecraft" and successfully "compresses a wide-ranging story into a tight, beautifully organized two acts." Critic Melinda Bargreen reviewed the production for both The Classical Review and KING FM. She calls this "an important piece, one that can bring you to the edge of your seat and also make you reach for a Kleenex, and one that has the whole-hearted commitment of a first-rate team of performers." In this cast of "unimpeachable excellence," Bargreen notes that, "It would be impossible to improve on the passionate performance of Kate Lindsey in the title role, a beautiful singing actress who breathes life into this role." She says William Burden sings Dodge with "remarkable finesse," and calls Nathan Gunn's Paul "deeply moving." Overall, she praises the "soaring score by Daron Aric Hagen, a masterly conducting job by Gerard Schwarz, intelligent staging by story writer Stephen Wadsworth, and singing actors who draw you right into Amelia’s world." The photo labeled "Act 1, Scene 2" is actually act 2 scene 1.